We get asked a LOT of questions from fellow bloggers, and followers about wanting to start a blog. So we thought it would be helpful and beneficial to start a page dedicated to resources for bloggers. These are sources and services that we use here at Uncommon Designs. Check back periodically as this list will change as we find other blog resources we want to share with y’all. So you want to Start Your Own Blog? Bluehost is a great place to start. They offer domain name registration, are affordable, and have an easy setup. We use Bluehost here at Uncommon Designs and it where we started by buying our domain name. The Genesis Framework is what we currently run here at Uncommon Designs. You will also need a theme, StudioPress Themes for WordPress has a lot of options to fit your sites needs. Have you experienced losing everything on your computer including photos? Yep…I have…not fun! I personally chose to use Carbonite to back up my computer including pictures. I had a second computer crash and I was so happy to be able to simply and quickly be able to restore all my info and pictures to my computer. When we started our blog, our email signups were through feedburner. We now use Mad Mimi and love it. It has a user friendly dashboard and setup. The online support is great too! We have grown our email list and it is incredibly easy to manage and customize. There are literally tons of plugins out there. Some are free and some you have to purchase. We have tried quite a few and absolutely love some and feel like they are “must haves” for our blog. Antispam Bee: Don’t like spam? Yes neither do we! This plugin greatly helps us keep spammers off our comments. Yoast WordPress SEO: This plugin walks you through optimizing your posts for the best SEO practices.It is easy to set up and helps to streamline writing posts. Login LockDown : Limits the number of login attempts from a given IP range within a certain time period. Scroll Triggered Boxes: Provides a popup on your site for announcements, signs ups, etc. Lots of options. Haven is a 3 day blogging conference in Atlanta, Ga. It is designed for the DIY Blogger but you will find bloggers from all genres at it. It is a smaller conference which means more interaction with both speakers and fellow bloggers. This was our first conferences we ever attended and it was incredible! We have been back as well. We met other bloggers at similar places in blogging and developed friendships that have lasted years. 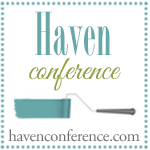 This is a great conference for those starting out as well as seasoned bloggers. Taking photos of projects, recipes, whatever for a blog has quite a learning curve. We both started with simple point and shoot cameras, believe it or not. We now both have DSLRs and are still learning about them and photography daily. One of the best resources you can invest in is both the camera and the photo editing resources. Picmonkey is an online photo editing program. It is what we use almost everyday! There is a free version as well as a premium one. It gives you great fonts, overlays, and editing tools. Want to take better pictures and learn at your own pace and at home? Try out an online Photography Classes from Craftsy. Craftsy also offers a variety of online classes to help you learn a new skill or sharpen your current ones.Shoot Fly Shoot… Shoot Fly Shoot is another option for visual, online photography classes.